New England's rare plants are in peril, and we are at the forefront of global efforts to save rare plants from extinction. We're banking their seeds to preserve genetic diversity and to ensure their survival in the face of multiple threats on the landscape. At the same time, we're restoring populations of the most at-risk species, have spent decades monitoring populations of rare plants in every county in New England, and continue to document the health of the 3,300 populations of our 388 globally and regionally rare plants. Our field research provides the data for our scientific publications, including our State of the Plants report and conservation plans for more than 100 rare species throughout the region. Read on to learn about some of the rare species we're protecting and our collaboration with both professionals and volunteers to accomplish our goals. Our innovative New England Plant Conservation Program (NEPCoP), for professional plant scientists, and Plant Conservation Volunteers (PCVs), a corps of citizen scientists, collect and share information about rare species. To locate and protect these plants, we founded NEPCoP, the first regional conservation network, nearly thirty years ago. Today partners in state agencies and private organizations in six states work together to build landowner relationships, share information, and develop conservation strategies. The state task forces select priority species for survey and seed collection, and evaluate results yearly. Members do field research—conducting surveys, managing habitat, and reintroducing rare plants—as well as off-site research, seed banking, and propagation. Plant Conservation Volunteers, NEPCoP's corps of citizen-scientists, help professionals in the field. PCVs trained by our staff scientists conduct field work and provide invaluable data to state Natural Heritage Programs and botanical professionals in all the New England states. What's more, they have helped to build a region-wide constituency for native plants. We have trained more than 1,500 volunteers across the region, who have donated more than 50,000 hours. Monitoring rare plants – Our staff members and state botanists decide which rare plant populations volunteers will monitor. Volunteers sign up for surveys at a day-long, annual training session,* conduct site visits during the field season, and complete rare plant surveys, recording the number of plants they find and other information. This information helps to shape protection strategies. Participating in field trips – Led by professional botanists and land managers, these experiences provide an opportunity for volunteers to learn more about plant species' ecology and conservation. Managing habitat – Volunteers can take part in management projects to help protect rare plant populations. Conducting botanical inventories – Volunteers occasionally help our staff members conduct botanical inventories for property owners to guide their land-management decisions. Please join us! Download our PCV brochure for details about qualifications and responsibilities. Use this form to apply. 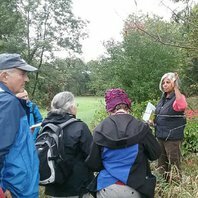 *Annual trainings for Plant Conservation Volunteers take place in March or April in all six New England States. See the right sidebar for this year's dates! Want to help? Shrinking public funds and accelerating climate change are pressing NEPCoP's member organizations to work with greater urgency and fewer resources than ever before. Please give now to help us save rare native plants. Today, 17 percent of New England's native plant species are on the brink of being lost—and another 5 percent have already disappeared from the region. With threats to our native plants accelerating, and a changing climate creating even more stress on imperiled species, we need to step up the pace of seed collection. Our goal is to collect and preserve seeds from most populations of the 388 globally and regionally rare species in New England.by 2020, the target date established by the Convention on Biological Diversity in its Global Strategy for Plant Conservation. With our well-established protocols and decades of experience, we are the only organization in our region able to lead an initiative of this scope. For our Seed Ark, we give priority to banking the seeds of species that exist in only a few locations, are declining rapidly, or are not currently protected. We must obtain the appropriate state or federal permits and landowner permission to collect seeds. The strict guidelines for collecting ensure that we do not harm the reproductive potential of the population. We clean and dry the seed and store it in a freezer at -18°C. 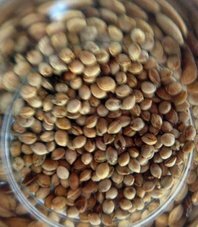 At regular intervals, we then test the viability of the stored seed and re-collect, if necessary. Read more about the Seed Ark on our Support page. Click here to donate to the Seed Ark now. How does a plant survive in rock crevices scoured by frigid torrents? High-energy river systems are some of the most dynamic habitats in New England. As spring arrives, the winter’s ice retreats, and flood waters and ice blocks move down the river with incredible power, scouring the shorelines and sometimes taking out bridges along the way. Yet a surprising number of rare plant species make their home along these rivers, including Furbish lousewort (Pedicularis furbishiae) on the St. John River in Maine, Robbinson’s hawkweed (Hieracium robbinsonii) on the Diamond River in New Hampshire, and the rarest of all, Jesup’s milk-vetch (Astragalus robbinsii var. jesupii) on the Connecticut River in Vermont and New Hampshire. All three of these plants are subject to intense scouring by ice and water, and the periodic clearing of woody and herbaceous vegetation from their shoreline habitats enables the plants to survive. The river, however, is a double-edged sword: it removes the competing vegetation, but at the same time threatens the rare plants. Plants that survive on rock outcrops on these rivers must also be able to tolerate drought, and where the river scour is intense enough to expose certain types of bedrock, Jesup’s milk-vetch can be found growing in the thin pockets of soil deposited by the river. The proper conditions for this rare vetch are apparently not very prevalent, for this plant is found at only three locations in the world, all within a 16-mile stretch of the Connecticut River. The plants bloom in late May or early June, and, like many species in highly disturbed environments, reproduce primarily by seed. Flooding can occur at any time during the growing season, and this species’ survival tactic seems to be to try to seed itself around as much as possible, increasing the chances that some offspring can find a suitable spot to germinate, mature, and produce seed. The price this plant pays for producing abundant seed may also be a short life. It seems to behave primarily as a short lived-perennial, with the adults often dying after bloom, usually in their third year. Intensive monitoring began in the late 1990s, when the plants were more abundant. As recently as 2012, however, two of the populations contained fewer than 20 plants each. Despite its up and downs, this plant has presumably survived at these few locations for thousands of years. But low numbers in any population of organisms increases the likelihood that a single event (a drought or, in this case, a month-long flood) could wipe out all of the adults in a given year, greatly reducing future reproductive potential. What if floods wiped out all the adults for several years in a row? With only three known populations, botanists have reason to worry about Jesup’s milk-vetch. More recently, invasive species are also posing a threat to this plant. In 1986, when we first collected seeds of Jesup’s milk-vetch to bank, the field records do not mention any invasive plants sharing its habitat. Today, several invasive species grow on the rugged ledges. Because of these threats, our Conservation department, in collaboration with the U.S. Fish and Wildlife Service, New Hampshire Natural Heritage Bureau, and Vermont Natural Heritage Inventory, is attempting to remove invasive species, augment existing populations, and introduce plants on sites that appear to contain suitable habitat. Although the staff has successfully germinated and grown Jesup’s milk-vetch in cultivation, the initial attempts to augment existing populations with these propagated plants were only marginally successful. Over time, however, as staff members have refined their techniques, more of the transplanted seedlings are surviving, blooming, and setting seed. After a shaky start, one population seems to be rebounding, which probably is the result of the transplants surviving to spread new seeds at the site. Botanists have canoed the river searching for additional populations of Jesup’s milk-vetch. Though they found none, they did find some potential habitat in which to introduce new seedlings: calcareous (chalky) ledges at the right elevation above the river to receive river scour. Several attempts to introduce seedlings on these sites have failed; but even these have provided more information about this species and its vagaries. Ultimately, the goal is to create several new populations and add enough plants to the three existing sites to enable Jesup’s milk-vetch to thrive. A Matter of Sunlight—but How Much? Since 1988, the Conservation staff has monitored a patch of small whorled pogonia (Isotria medeoloides) at an experimental site on private land in New Hampshire.The experiment consists of thinning the canopy in varying degrees to admit different levels of light to the floor of the mixed conifer and hardwood forest where this delicate yellow orchid grows. Because Isotria has never been successfully transplanted, the goal is to understand how to maintain it in its natural habitat. Brumback says that this finding means that if this or other Isotria habitat were formally conserved, land managers could preserve the orchids simply by thinning the canopy over them. "And, because these plants continue to proliferate beneath the sections of the canopy cut in 1998 and not thinned since then, we might not need to thin very often," he says. Over the past two years, however, the number of Isotria stems emerging beneath the canopy has declined slightly since the initial thinning. Further monitoring, says Brumback, will reveal whether this represents a true decline, possibly due to the denser canopy, or a normal variation. Such is the nature—and the luxury—of long-term observations of a single population of rare plants. The Seed Ark is our five-year, $5 million initiative to collect seeds from 388 rare plant species in New England by 2020. Please help! Did you know that your organization can hire our expert Conservation staff members for special projects? Earn your certificate in Field Botany or Advanced Field Botany with us!